Why Should I Choose Ocean Freight for My Shipment? No matter what business you’re in, it can be tough to pursue the international markets while still keeping your shipping costs manageable. If you don’t have the added challenge of a tight deadline, ocean freight can be a good way to keep costs down while still using a reliable shipping method. Ocean freight gives you the benefits of worldwide capacity and reliable sailing times – and the best part about it is that it’s much more cost-effective than air freight for international shipments. Take a look at the reasons you may want to choose ocean freight for your next international shipment. Ocean freight gives you the benefits of worldwide capacity and reliable sailing times – and the best part about it is that it’s much more cost-effective than air freight for international shipments. AFP Global Logistics is able to handle any size shipment, whether you need a full container load, a less-than-container load, or an oversized load shipped. 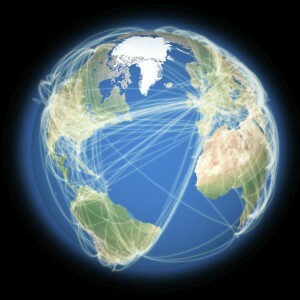 We can coordinate your shipment from any major port all across the entire world. Ocean freight is your best option for regular scheduled consistent freight, or when a hard deadline isn’t necessary. We’ll assist you with all the necessary documentation required for import and export, door-to-door, or port shipping. When Would I Choose Ocean Freight over Air Freight? When choosing a freight method for your shipment, there are three factors you should keep in mind: cost, speed, and reliability. Ocean freight is your best option when you need to ship on a smaller budget and don’t mind when it reaches its final destination. Ocean freight does tend to be less reliable than air freight, but works well if you have a few days to spare. In situations where you require shipment on an exact timeframe, air freight is the only way to go. It wins in terms of reliability and speed. This entry was posted on Wednesday, September 23rd, 2015	at 7:36 am	and is filed under International Shipping, News	. You can follow any responses to this entry through the RSS 2.0	feed. Both comments and pings are currently closed.